Suriano: Missa Nos autem gloriari; Aichinger: Missa de Beata Virgine, Regina Coeli etc; Haller: Laudes Eucharisticae etc. Palestrina: Missa sine nomine – Credo. 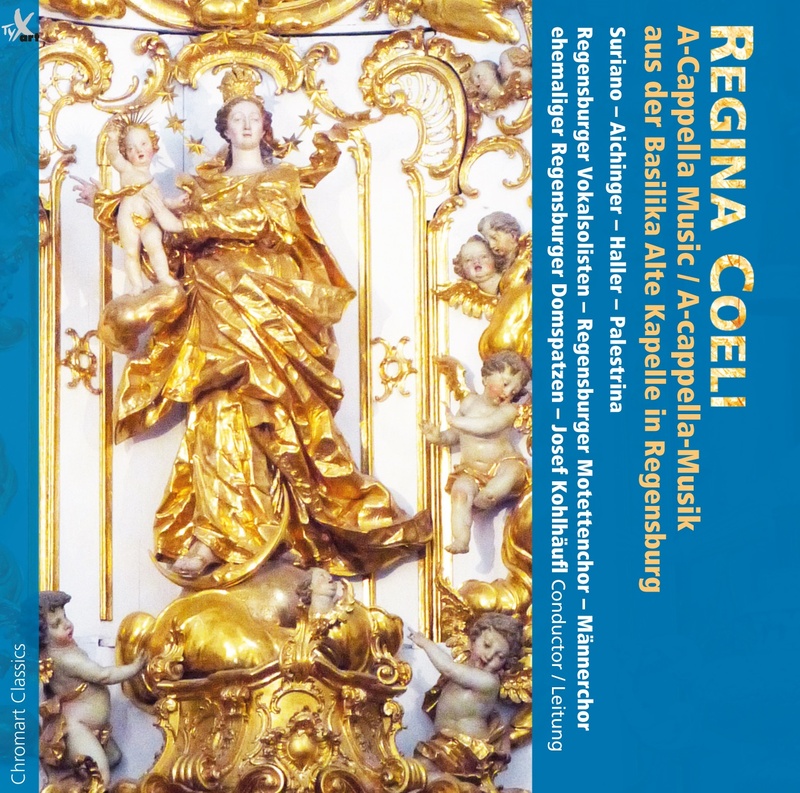 This CD reflects the tradition of polyphonic singing in the style of Palestrina that developed during the 19th century in the collegiate church of Our Lady of the Old Chapel in Regensburg, a tradition that later extended to the Cathedral and its famous Domspatzen boys choir. The recordings are intended as a tribute to the conductor Josef Kohlhäufl, director of music at the Alte Kappelle from 1984 to 2011, who revived the polyphonic tradition during his tenure. These recordings were made in 1998 and 2000, the earlier recordings, of Michael Haller, with the Regensburger Motettenchor being rather different in both recorded sound and vocal style than the latter offerings. Haller was a 19th century composer who was instrumental in developing the polyphonic tradition in the Alte Kapelle, becoming known as the “Palestrina of the 19th Century”. I am not sure if the Regensburger Motettenchor are deliberately attempting to recreate a 19th century singing style, but there are certainly traces of that, not least in their prominent vibrato. Far more interesting and musically more compelling (and rather better performed, by the mixed-voice Regensburger Vokalsolisten) are the works by Suriano and Aichinger. Suriano (1549-1621) was a pupil of Palestrina and became director of music at several of Rome’s most famous churches, including St Peter’s. His music develops the style of Palestrina to include more homophonic sections, thereby making the text easier to follow. Aichinger (1564-1628) was born in Regensburg and studied in Munich and Ingolstadt where he developed links with the Fugger family, including the future Prince-Bishop of Constance. The family funded much of Aichinger’s future study, including a period with G Gabrieli in Venice. He settled in Augsburg, seat of the Fugger family. The CD concludes with a piece of genuine Palestrina, the Credo of his Missa sine nomine for male voice choir, sung by the Men’s Choir of former Regensburg Domspatzen in a style not dissimilar to the Motettenchor. Although the music is interesting, the quality of the singing is perhaps not guaranteed to find much of a following in the realms beyond Regensburg.